We are studying penguins this week...one of my favorite units all year! Here's our math centers and a fun little math "art-tivity". 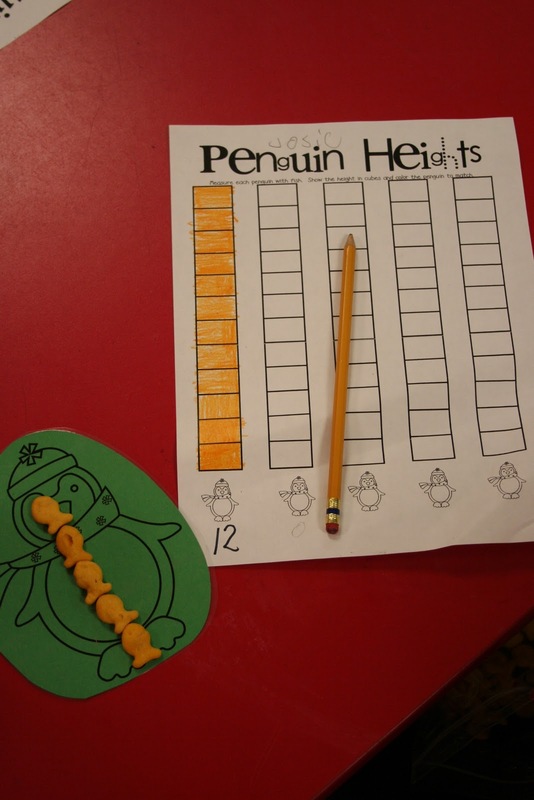 You can find these centers (plus lots more) in my Playful Penguin Unit over at my tpt shop. Literacy centers to come later this week! And, I just posted my Happy Hearts Valentines Unit on tpt if you want to check it out. Thanks, as always, for reading my blog. I'll give my new Penguin Unit to one random person that comments on this post. Be sure to leave your e-mail in your comment so you can grab your freebie! Oh I love the pink scarf on that penguin :) Love your blog! Holy buckets, your penguin ideas are cute. We are doing penguins this week, too and my students are obsessed with learning about them. I may have to carry the theme over to next week and try some of these fun math ideas. Thanks for sharing! I love all of your ideas!! Precious! I love your blog! Thank you for sharing your wonderful ideas. So very cute! Love to read the ideas you have for your class! I love your blog and have purchased almost all of your units! Your students are so lucky to have you and your great ideas!! You are so inspiring! Thanks for sharing so many fantastic ideas. Super Cute!! Love your penguin unit!! I love your units. You are one talented lady!! Fingers crossed! I love all of your units! I love the penguin "How many more". Great idea. That is one of our TEKS and I hadn't thought of putting it in a work station. I hope I win!!! awwww...thanks! I'm going to put more games like this in my upcoming units too! Julie your Penguin unit is adorable! I was wondering how the "How Many More" activity works (I can't quite figure it out from the picture). I bet your Valentines unit is just as cute! They have to figure out how many more squares/blocks the taller tower has than the shorter tower...they've done really well with it so far. :) Does that make any sense? 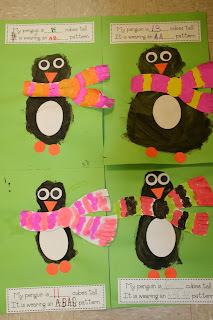 Your kiddos did such a great job painting their penguins!! Too cute!! Always love what you do! I already did my penguin unit this year, but honestly, your packets are my favorites, so I would love to win this to have for next year! I would love your penguin unit! I would love to win your penguin unit. You have such amazing units and themes! And I absolutely love the way that you create your centers- with different colors, coloring in the graphic, and then answer. I have never centers organized/ created that way and it is my new favorite way to do centers. Thanks for sharing all your wonderful ideas!! I love this penguin unit...looks cute! These penguins are great!! I have several of your units and they are wonderful!! I am so new to this and I continue to fall in love with your blog as well as others daily. I hope one day to be as creative as your guys are! I just want to say that you are amazing!!! Thanks for inspiring me everyday! I have seen so much growth in my students, and I know that all of your fun activities have helped my little ones grow!!! I love all your units. I think I almost own all of them! LOL Your love for teaching is very evident. Thank you for sharing your creativity. Very cute! I love the " how many more " center idea....that's such a hard skills for my kiddos! I always love your ideas - oh - and I am tagging you! I love the way you incorporated an art project with math. Great way to integrate. 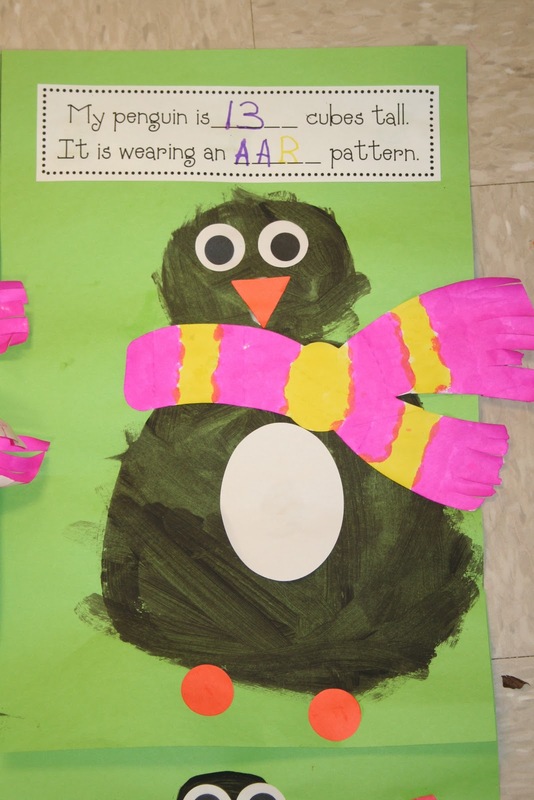 We are studying penguins this week. Thanks for sharing your ideas. Thanks for being such an inspiration! LOVE your units! They are great! Great ideas Julie! I liked the odd, even activity with fish crackers! So clever! Love to see your new ideas! As always, I LOVE your ideas! Thanks for sharing them! So cute! I love penguins! I love,love,love your stuff! You are truly one talented teacher.....thanks for you do! I just bought your Valentine's Day unit and have been preparing it all evening! I just love everything you do. Your penguin unit looks like so much fun! Wow! I am amazed at your creativity! I look forward to reading your posts. I just purchased your Animals in Winter unit...love it! Now I want all of your units...hope I win! Julie...I am so grateful for ALL the ideas you share and how YOU help to make my classroom a FUN, learning environment! You AmAzE me with your creativity and talent. I get very excited each time I see that you have a new post! I have purchased several units and love them all! I hope one day I will have ALL of your amazing units ;) ThAnK YoU!!! Very cute penguins!! I like the way they worked on measurement and patterning while having some fun....NICE! Thanks for sharing... I'm excited to have the chance to win one of your fabulous units!!!!! Very cute! I can't wait for The February Intervention Pack! 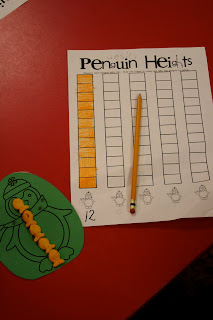 Last year I managed to make my Penguin unit last the whole month of February!It is my favorite unit to teach. My class loves your centers. Their behavior is always great because they are so engaged! These activities look so fun! I know my kids would love learning about penguins. Thanks for always sharing your wonderful ideas! I always look so forward to when you post your units. I love seeing what you're doing in your classroom. All your activities are so cute and creative. And I love the patterns on the penguins' scarves. Great idea! Your penguin unit is adorable! super cute! would be so fun to have these. I would love to try the penguins unit with my class. I have the hearts unit ready to go!!! Happy Wednesday! I love your penguin measurment ideas! fabulous job! I love all of your units! I am so glad I found your blog! Thanks you for all your great blog posts! You have the best ideas. Thanks for the chance to win. TAG...You're it! Hope you play along! I LOVE all your ideas and would love a chance to win the penguin unit! 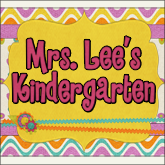 Julie, Your units are my favorite on TPT! Thank you for your hard work. It makes things so easy for me to plan. I would love your penguin unit! Hope I win! I love the Penguin Unit being that I am a penguin fanatic. My kiddos would have much fun with it. 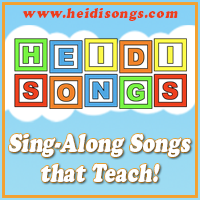 Julie-your activities TOTALLY meet the needs of my kids. LOVE your creativity. Love your ideas! Too cute! 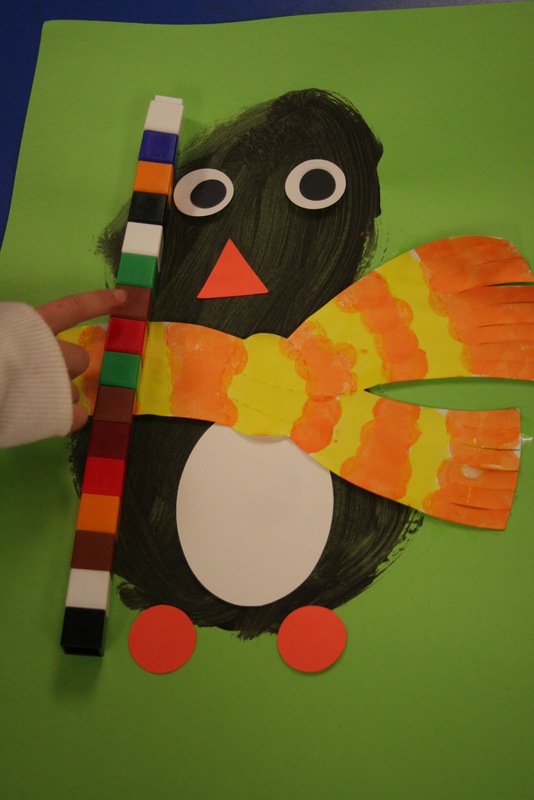 I already did my penguin unit, but these activities looked great! These activities look so cute! I love them! Thank you for sharing. it doesn't take much to interest me in YOUR centers. they are always so thoughtfully done and are practical applications to the kindergarten day! i like the idea of them painting a penguin and then using it for measuring. i plan on doing that...thanks for the suggestion. Those penguins are just sooo darn cute! Your penguin unit looks so adorable!! I was wondering if you would be having any sales in your tpt store soon?? I would love to grab this and some of your other adorable units!! Thanks!! I really like your unit. I just finished a unit on penguins which was a collection of everything! The only thing I didnt have enough of was Math activities around the theme. I am so upset that I didnt see it earlier but there is always next year! How do you store all your centers!! I love all of your ideas just not sure how to store all of them. Thanks for sharing....how do you have the time? Great job! so cute! Can't wait to use it!